The true King is Jesus, the Son of God, humble and meek, who came to serve humanity, and to teach us how to live the abundant life. Jesus, the Son of God, whose Words are the Words of the Father, obedient to Him and without sin, came to the world, to sacrifice His life for the salvation of humanity. Only Jesus, the perfect paschal lamb, without blemish, reconciled us with the Father, forgiving our sins, and granting us the gift of eternal life. Yet, Jesus’ generation thought more of a revengeful king, who would free them from the yoke of the Roman Empire, from servitude, and from indiscriminate taxes. Many cared little about the state of their souls, their sins and true repentance. Jesus’ gift was spiritual, eternal, more precious than gold. “You hypocrites! Well did Isaiah prophesy of you, when he said: “‘This people honors me with their lips, but their heart is far from me; in vain do they worship me, teaching as doctrines the commandments of men,’” (Matthew 15: 7-9). The same Pharisee spirit who accused Jesus of calling himself King of the Jews, during His “trial,” and shouted with the same multitude: “Crucify him, crucify him,” is living today among us and wishes him and his teachings death. These pharisees have their “own religion,” “their own commandments,” go to Church, or lead churches, and if they can, they profit from Christ. There is no love of God in them and for that reason, they cannot love their neighbor. 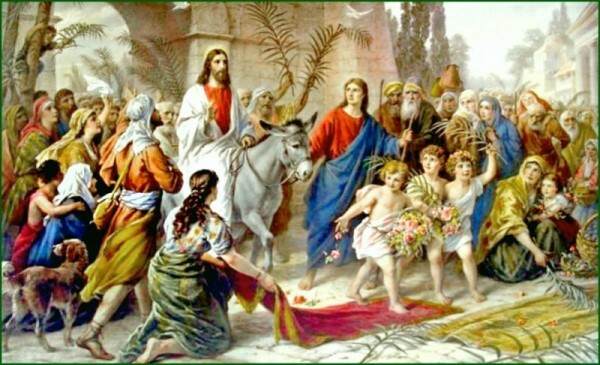 Jesus’ disciples and the multitude who saw Jesus’ miracles and who shouted joyously “Blessed is the King who comes in the name of the Lord!,” abandoned Jesus during his apprehension and hid, and Judas betrayed him. Only John the apostle and a few women remained with Jesus, to witness the precious gift of God, His only Son, Jesus of Nazareth, hung on the tree. Today many are saying, “I don’t want Jesus to be the King of my soul, and I don’t want his gift of eternal life.” Most probably, they would be among those shouting, “crucify him, crucify him again, we don’t want him, we hate him for teaching us what opposes the world.” Many today, believe in a false Christianity, that gives preference to material prosperity, rather than living the meekness and humility of Jesus, or his life of service and love of neighbor. “No one can serve two masters. For you will hate one and love the other; you will be devoted to one and despise the other. You cannot serve both God and money, (Matthew 6:24). Who is the King of your soul? Who is your master? “Love not the world, neither the things that are in the world. If any man loves the world, the love of the Father is not in him. For all that is in the world, the lust of the flesh, and the lust of the eyes, and the pride of life, is not of the Father, but is of the world. And the world passeth away, and the lust thereof: but he that doeth the will of God abideth for ever,” (1 John 2:15-17). Previous Are You Born Again? by J. C. Ryle (1816-1900). Next Holy Week Meditations. Holy Monday: The Cleansing of the Temple.